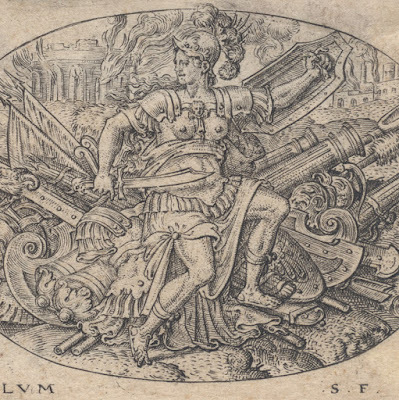 “Bellum” (aka “War: Bellona sits on a trophy of arms” [La Guerre: Bellone assise sur un trophée d'armes]), 1550–72, plate 3 from a set of six works representing figures from classical mythology. 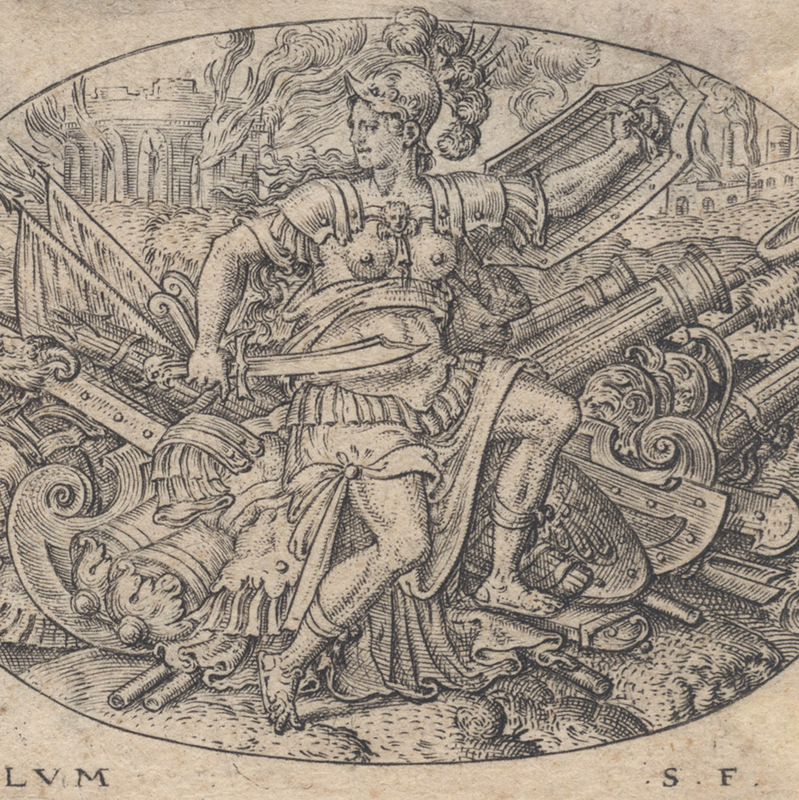 Note that there is also an almost identical set of three of these prints executed by Delaune in 1575, but close examination reveals differences (e.g. 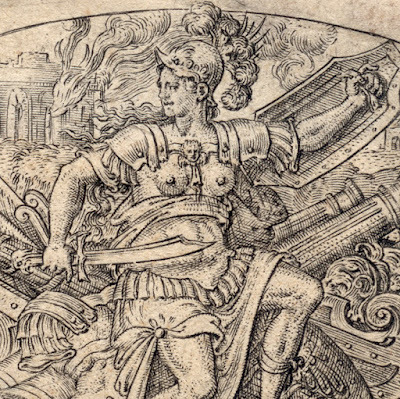 the plumes on Jupiter’s helmet do not protrude through the oval border as they do in this print and the position of Jupiter’s right foot is different and, even more noticeable, the later version is dated 1575); see the later version at the British Museum no. 1834,0804.221-223. 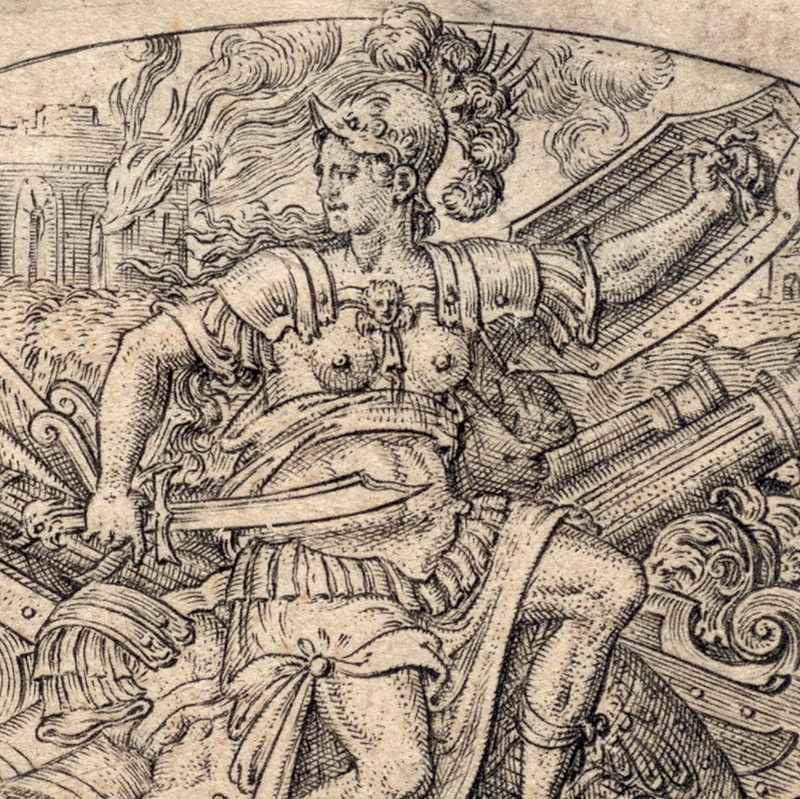 Engraving on fine laid paper trimmed with margins on three sides but slightly within the platemark on the right side. Condition: crisp impression with small margins on three sides and trimmed within the platemark on the right side. The sheet is in excellent condition for its age (i.e. there are no tears, holes, folds, abrasions or stains) and is attached by old mounting hinges at the top verso to an archival support card. 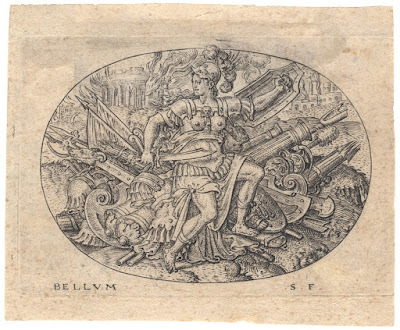 I am selling this tiny masterpiece of engraving from the Renaissance era for the total cost of AU$216 (currently US$168.19/EUR142.94/GBP127.47 at the time of posting this listing) including postage and handling to anywhere in the world. 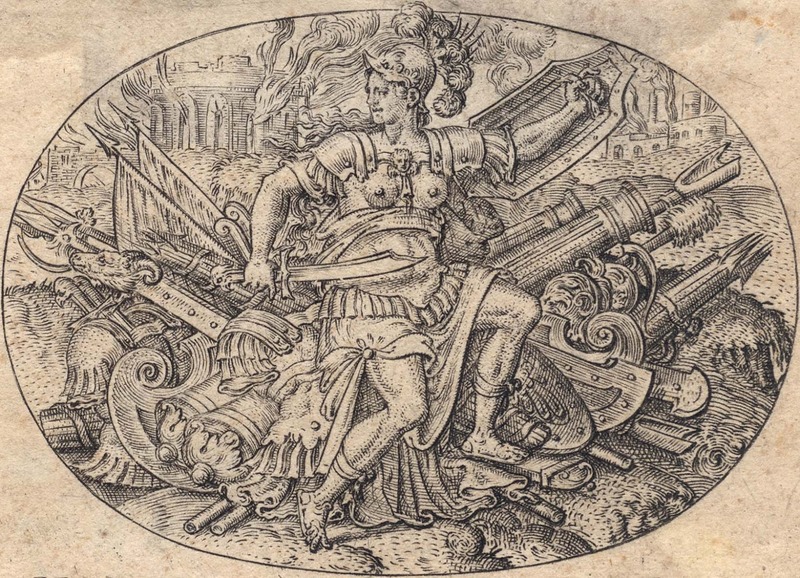 If you are interested in purchasing this rare and precious print from the mid-1500s, please contact me (oz_jim@printsandprinciples.com) and I will send you a PayPal invoice to make the payment easy. 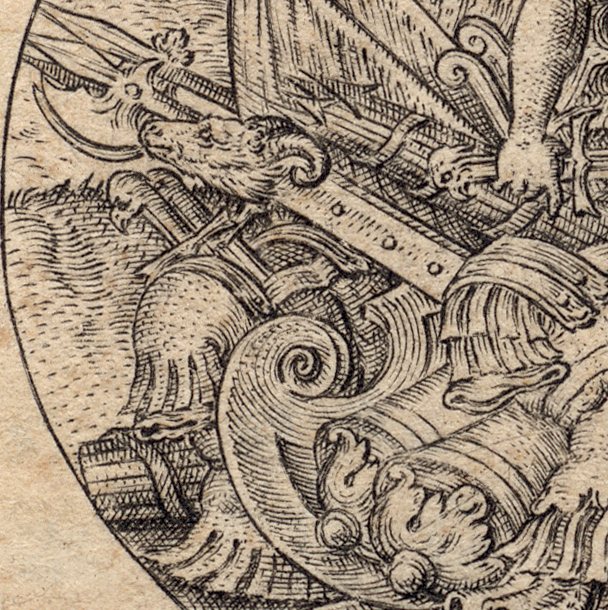 Although this small engraving is only about the size of a biscuit—an observation based on feeling a tad hungry at the moment—it has the arresting impact and grand visual statement of a huge mural. In short, Delaune knew how to craft an image for maximum graphic strength and I’ve decided to offer a few personal ideas about how Delaune achieved this feat. 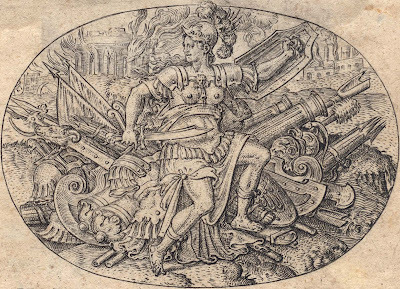 Like most images that arrest the eye, Delaune’s composition figuratively “pokes your eye out.” For me, the portrayed array of armoury on which the centre figure sits is positioned like pins radiating from a pin cushion with all the pins’ sharp ends facing dangerously outwards. Delaune, however, does not stop at using this device to arrest the eye. He also portrays the central figure, Jupiter—the mythological god of war, hence the title of this engraving, “Bellum”, which is Latin for “war”—as if Jupiter were invading the viewer’s personal space. 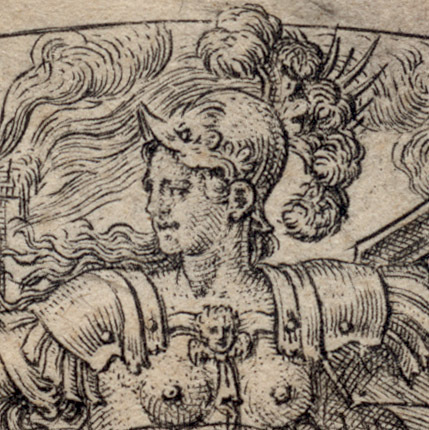 This notion may seem odd at first, but note Delaune’s clever use of the plumes on Jupiter’s helmet that are drawn OVER the oval border. This tiny visual device of allowing the figure to migrate “out” of the pictorial space of the image effectively creates a mildly uncomfortable feeling that Jupiter has left the space of the picture and is entering the spatial realm of the viewer.